Bradshaw Crandell was one of the most famous "pretty girl artists" of his day. Bradshaw Crandell did dozens of pastels for calendars along with magazine covers for Cosmopolitan, Saturday Evening Post and Redbook. This beautiful pastel measures 20 x 24 inches to outside of frame with the sight size being 10.5 x 13.5 inches. This pastel is on paper and in very good condition. It is unsigned. 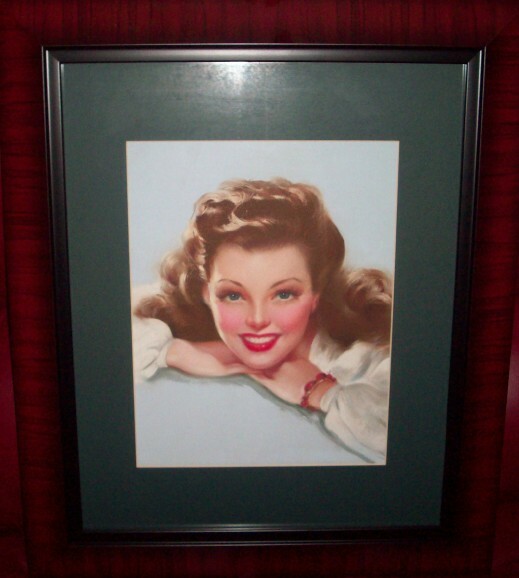 Bradshaw Crandell did several pastels for the Gerlach Barklow Company of Joliet Illinois. He often visited Joliet and was friends with some of the upper management personnel of the calendar company. He even took some of his vacations with them. This pastel was found in Joliet and is believed to be by Bradshaw Crandell.